I placed seventh at this season’s Latin American International Championship. I played the same 60 cards as the champion, Daniel Altavilla. I’m very proud of my group’s performance with a new Zoroark-GX innovation developed only a few days before the event. The overall story of this event is unique, one spotted with control decks, Granbull, Zoroark-GX, and of course, scandals. Going into this event I expected lots of Alolan Ninetales-GX / Decidueye-GX and Buzzwole-GX / Lycanroc-GX, with uncertain sprinklings of most other decks. I was right for the most part, but I erroneously discounted the popularity of Zoroark-GX / Lycanroc-GX. It didn’t have any effect on my own tournament experience, but it could have had I chosen a different deck. It’s no surprise to me that it did so well and in such large numbers, as new decks like Alolan Ninetales-GX / Decidueye-GX and Granbull awarded it with some newfound great matchups. I saw Zoroark-GX / Control as the perfect play for this event with so much left up in the air and great matchups against the decks that I knew I should expect. It was a surprise and definitely caught most people off guard, so playing a deck that did that for me granted another inherit advantage against many. These numbers are a good indicator for gauging how many of a certain deck you might face in upcoming events, particularly Roanoke, Virginia Regionals this weekend. I would want to for sure be beating Zoroark-GX / Lycanroc-GX; Alolan Ninetales / Decidueye-GX; and Zoroark-GX / Control, at a minimum, going into this event. More on this and some deck ideas to come! Zoroark-GX / Control was the best play for this event and as such, it won. Granbull put up the next best results, followed only by Decidueye-GX variants. Blacephalon-GX played out its presence at the event as well, and Alolan Ninetales-GX joined the Buzzwole-GX squad for a Top 8 birth as well. A control deck of any kind always changes the metagame landscape for future events. As such, I would predict that nearly every deck this weekend will be built to give itself a fighting chance against the build. I know I will be operating under the same notion; I do not think it is wise to play something that loses to control after it did so well. Control decks are always popular in the masses and many players flock to them because they enjoy that style of a deck. Now just pick your counter, an Oranguru with Resource Management, or just a deck that can beat it outright. Zoroark-GX / Lycanroc-GX was the most played deck, I would reckon that most players played against at least one in the event. Many of the game’s best players used Granbull, so it finally came out of the closet as a top tier deck as I predicted in my article on the deck before the event. Others like myself used Zoroark-GX / Control, but I would consider that a one-time thing as I can’t see the deck being all too great moving forward with counters developing and people having an opportunity to test against it. Decidueye-GX has seen a resurgence and I would laud you to play Machoke in your deck if you’re using Ditto Prism Star already and are having trouble with Feather Arrow damage. That simple addition can swing a Decidueye-GX matchup in your favor. Many decks feel mediocre like Buzzwole-GX, Malamar, and Rayquaza-GX. I don’t expect these decks to be played as much moving forward as they may have simply been used sort of in a testing pattern as many players have used them in the past and may have wanted to stick with the deck in an unknown format. Now, with many of the crazy decks out of the woodwork, I can’t see those low ceiling decks having continued success. So Lost Thunder dropped, we got a bunch of new archetypes like Alolan Ninetales-GX decks and Granbull, but alas, Control is back. Control is frustrating to play against, and yes, I do sympathize with those that are paired with it even when I am playing the deck myself. It can be incredibly frustrating to have your very own strategy depleted with relative ease through a barrage of degenerate Item and Supporter cards. Control never seems to do well multiple tournaments in a row, so I expect that trend to hold true and the counter techs to arise once more for this event. I fully expect to play a deck that either beats control or a tech to counter it and I expect most top players to follow in that decision. Going into the weekend there were few decks I was worried about, but there still were a couple. This can be a difficult matchup if you can’t deny your opponent’s Energy to the point where a Blacephalon-GX is left with zero Energy on it, but it’s a terrible matchup if the Blacephalon-GX list is playing Energy Switch. Energy Switch can power a Blacephalon-GX up in one turn with Charging Up from Naganadel and then an attachment from the hand. These decks usually play multiple Tapu Koko and an Onix. Land Crush is enough to body Zoroark-GX and the free Retreat Cost pivot of Tapu Koko makes it easy to build a new Onix over and over following a Knock Out (the best hope in this matchup is to take Prizes by targeting Malamar). This is just more of a tech, but with Oranguru in other decks they can get resources back and alleviate some of the damage done by your disruption cards. Once your opponent starts getting resources back your hand becomes a little forced and you might have to take a Knock Out on the Oranguru to stop it. Unown “Hand” is really good in this deck, as well as other control decks. 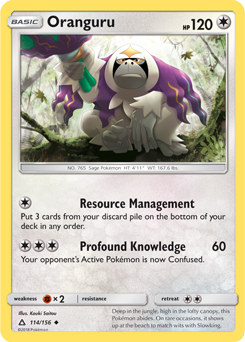 I didn’t realize this until about halfway through LAIC, but I immediately wanted the card in the list. Sometimes people will draw and pass against control decks, but you can punish that with this nifty Ability. Many decks aren’t even playing Marshadow or Judge anymore, so putting your hand down to a lower size is usually a thing of the past. Since Oranguru can so easily recycle cards and Trade draws you them right back, in no time at all you can hit the 35 or more mark and declare yourself the winner if Unown is your Active Pokemon. I see this inclusion improving the deck, as would a Mars. To make room for both of these I think cut Sableye and a Team Skull Grunt from the original list.